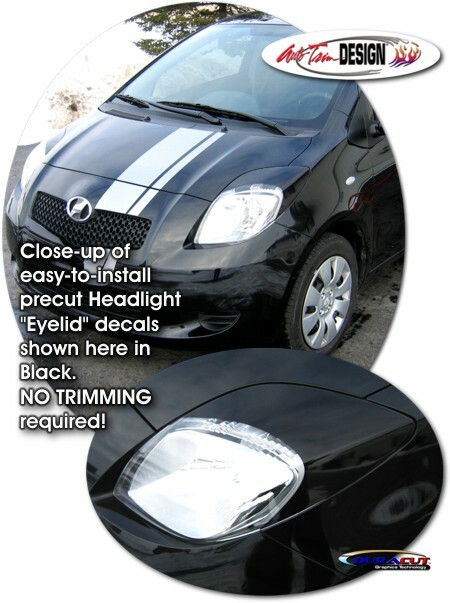 Give your '07-'11 Toyota Yaris / Vitz Liftback that "Mean" look with these precut "Eyelid" decals (no trimming required). Decal set comes with two (2) lids (one for each side). Available here in Gloss Black. They're very easy to install and include easy-to-follow online instructions. Note: Some colors may be translucent when lights are on. If you desire a "solid" look with no light shining through, we recommend installing a set of "Eyelids" in Black prior to the color you desire. Moreover, due to the irregular shape of the headlight, we suggest starting the installation at the point shown by "hinging" the decal and working each way.